EXTEND Thru August 21st “Death and Harry Houdini” (The House Theatre): Be Astonished This Summer! 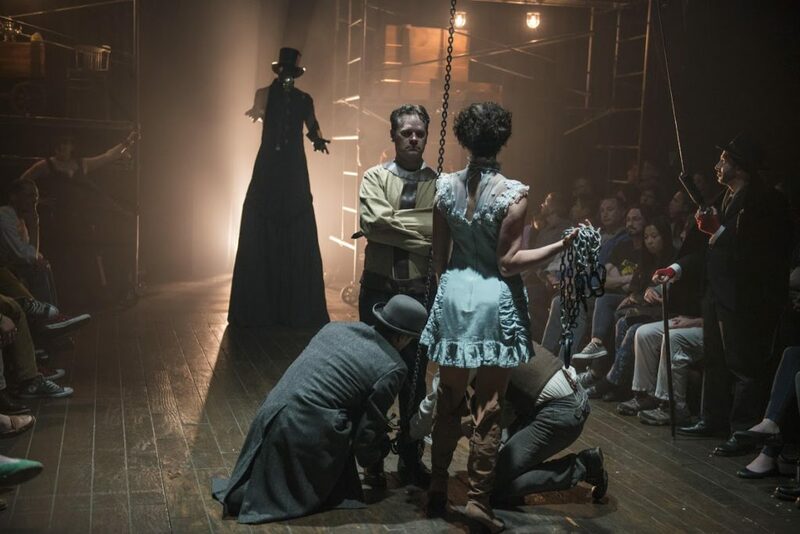 The House Theatre of Chicago presents DEATH AND HARRY HOUDINI. 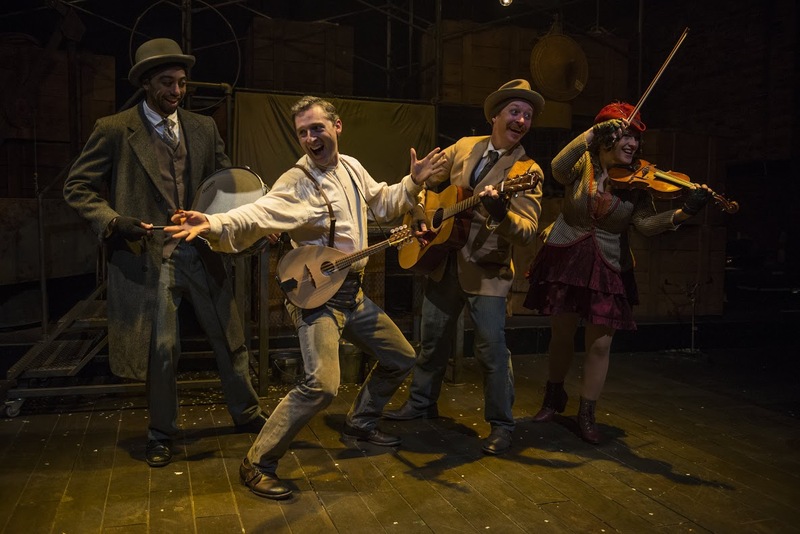 Playwright and Director Nathan Allen tells the story of the legendary magician. The childhood loss of his father led Houdini (played by the magnificent Dennis Watkins) on a life-long quest to beat death. Allen thoughtfully examines Houdini’s obsession and arrogance in this whimsical biography. Allen skillfully weaves together actual statements uttered by Houdini in the play’s dialogue. Proclamations like “If anyone should escape the bonds of Death, it will be me!” are the reason that ninety years after his death, the name of Houdini continues to describe superior escape artistry. Who better to embody Houdini than Chicago’s favorite magician, Dennis Watkins? Third generation magician Watkins is on hiatus from his own show, The Magic Parlour at Palmer House, to resurrect the role he debuted in 2001. The charismatic Watkins mystifies with multiple tricks and feats. 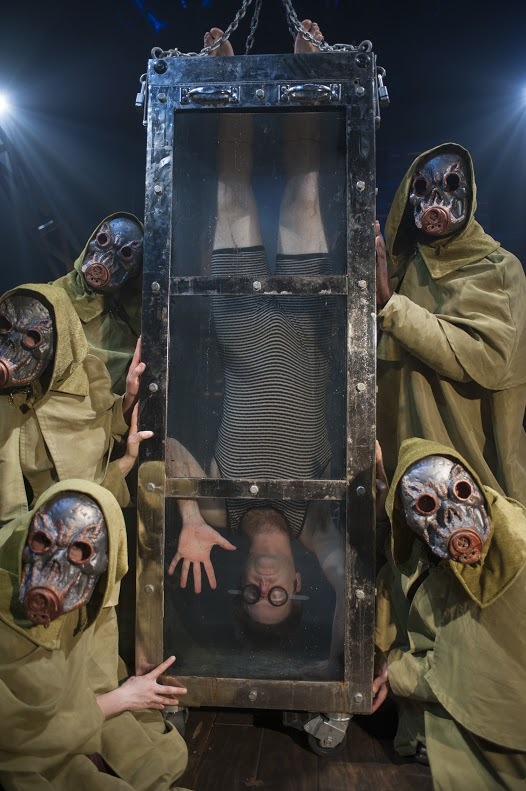 He enters the show suspended from a chain upside-down in a straitjacket. As he chats with the audience, he releases himself from confinement. And that’s how the show starts! Where could it possible go from there? A Chinese Water Torture is the ultimate finale! Watkins recreates Houdini’s act by being dropped head first into a water chamber. He is locked in. It’s disturbing and the process is too long for my comfort. Yet, Watkins reappears wet and smiling. In between these jaw-dropping stunts, Watkins marvels his guests with walking on broken glass and swallowing razor blades. There are even interactive audience moments of card tricks and brown bag swapping. The magic is in a word, MAGICAL! The talented ensemble also give a bewitching performance. They sing, dance and support the thrill surrounding the unexplainable. They play instruments and harmonize providing a merriment that nicely contrasts Watkins’ dark intensity. Although the comedy stylings of Shawn Pfautsch (Theo/Dr. Lynn) add hilarity, it’s his unexpected ability to shake the rafters with a breakout solo moment that is unforgettable. Marika Mashburn (mother) and Carolyn Defrin (Bess) play the important women in Houdini’s life. Mashburn is a monster-in-law nightmare to the sweet Defrin. Mashburn wickedly mutters in a gibberish that The House refers to as Mashburnese. It hysterically sounds like a legit version of a small village’s Yiddish. I love how Watkins and The House conjure up magic. I’m always baffled but in a good way. I’m less the cynical adult and more my youthful self that believed the impossible was the result of magic. DEATH AND HARRY HOUDINI is phenomenal. I highly recommend letting Watkins and The House astonish you this summer. PG SIDENOTE: Even though this is a magical journey, death themes are strong. Parents beware. At the Chopin Theatre, 1543 W Division St.
Thursdays and Fridays at 7:30 p.m.
Saturdays and Sundays at 4 p.m. and 8 p.m.
Additional performances on Wednesdays at 7:30pm in July.